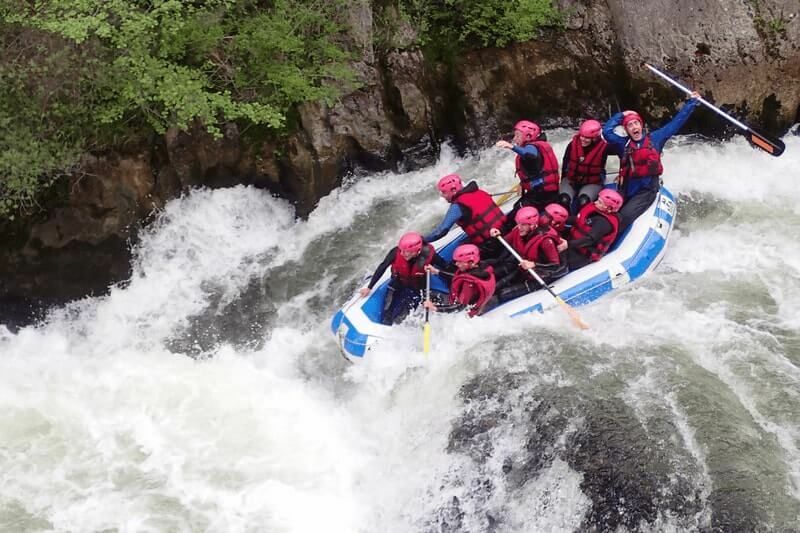 This 7 km course is considered as the best spot of the French Pyrenees for white water activities and represents the classic in rafting. This trip will take you to the most active part of the upper valley of the Aude river. The departure is from our base downstream of Axat. The first rapids (Class of difficulty II, III) allow the different crew members to maneuver the boat in good humor before confronting the Pierre Lys Gorges and its tumultuous and sustained rapids. The program: the Flipper, the Triple Fall, the Wallet, the Dessert .... (Class III/IV). Rendez-vous on our base and boarding directly from the Camping du Pont d'Alies, upstream of the village of Saint Martin lys. The guide gives you your insulated equipment and explains navigation, safety and your role for teamwork. This route constitutes the second part of the integral route of the gorges of the high valley of the Aude river. Children under the age of 14 can participate in your aquatic adventure until the entrance of the Pierre-lys gorges, 5 km of activity, where the minibus awaits us. According to your wishes or the recommendations of the guide you can leave the boat and join the group on arrival, by bus. Qualification: State Diploma of Canoe Kayak and Raft qualification in highest levels white waters. Duration: 2h00 total, 1h15 on the river. All participants must know swimming 50 meters.